When I go to a restaurant with you, I secretly observe what you order. I make a mental note of whether the sweetness of the mango sorbet lingered on your smile. I take note if the wasabi was a bit too much for your new sushi tongue. And if you share your secret pancake recipe with me, well, then I know you’re a pancake lover and I’ll spend the rest of my days trying to make you the best pancakes ever. See, that’s how it went down for FunnyGirl and me. We met and she wowed me with her pancakes. Listen here people: wanna impress someone special? I said special–don’t be making somethin’ for the random you met at the night club last night. Make your special someone something–some pottery, a knitted scarf, a castle in the sand, or in my case, something warm fresh off the stove. Before FunnyGirl, I was not a pancake lover. Pancakes always made me think of my friend Evelyn’s grandmother who once told us we must stay away from flour if we want to avoid blowing up like balloons–funny how certain things stick and linger for years. Well, thankfully, I snapped to my fluffy-pancake senses, and today I enjoy my flapjacks with zero guilt. 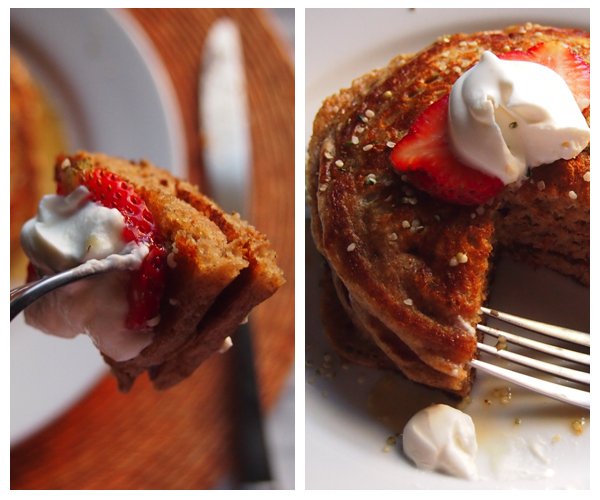 Ever since discovering how easy it is to make pancakes, I like to play around with flavors, different flours, and healthiness. Today I share with you my exploration of a spice called cardamom. 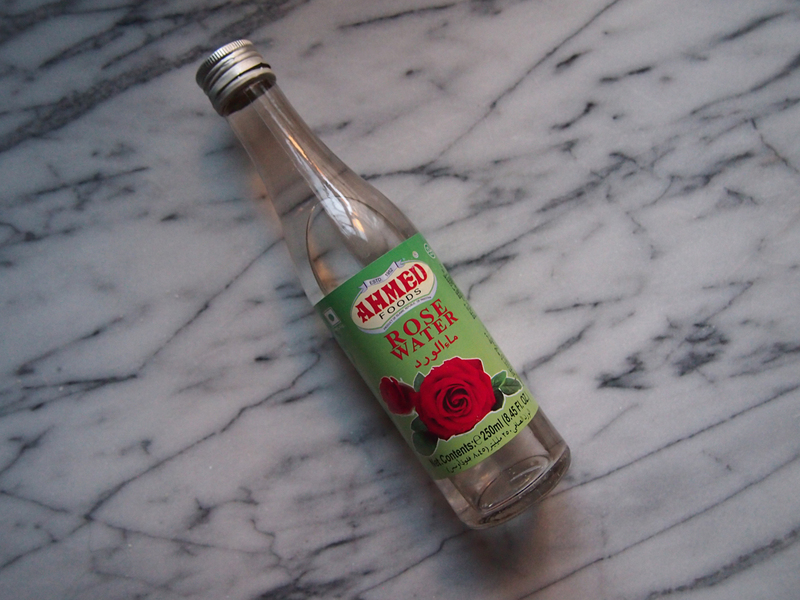 I also introduce you to rosewater. Yes it smells and tastes like roses. It works trust me, you just gotta go easy with it. 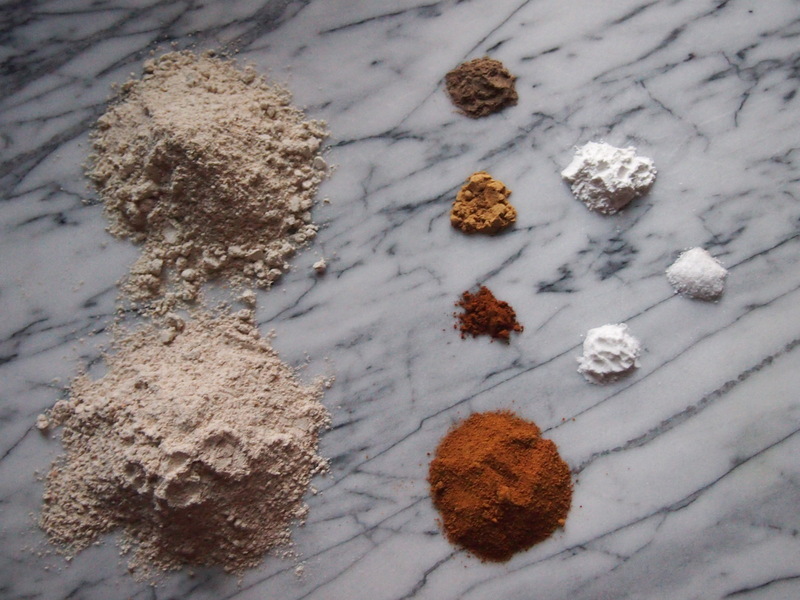 Both are flavors common to one of my favorite cuisines–Indian. These are light, fluffy, exotic, and I’ll even say sensual. I would serve these to someone I’m smitten with. I would serve these for a breakfast-in-bed rendezvous. And I would most definitely make them for someone I love. You’ll need two bowls, one larger than the other. In the larger bowl, using a whisk, thoroughly mix all your dry ingredients. In the smaller bowl, combine all your wet ingredients. Now, pour the wet mix all at once into the dry mix. 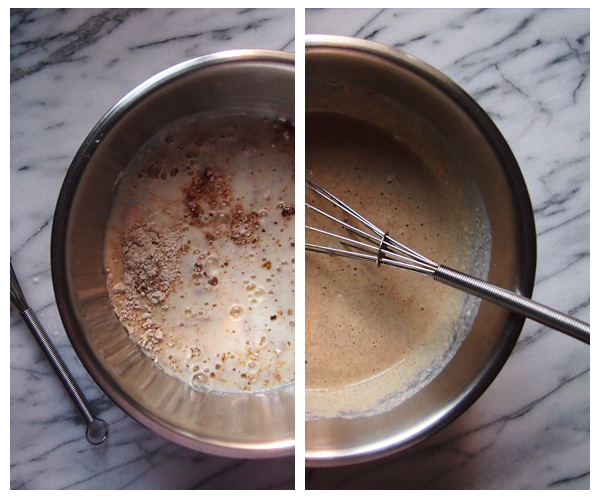 Whisk until well combined, but don’t over mix or you’ll end up with flat pancakes. You may still see a few tiny lumps of flour, that’s ok. Pre-heat a non-stick skillet on low heat for 3-4 minutes and lightly coat with the oil or butter of your choice. Using a 1/3 cup mearsuring-cup pour the batter into the pan and cook on first side for 2 1/2 to 3 minutes. Flip the pancake and cook another minute or so. Serve with fresh strawberries and a dollop or two of the rosewater cream (recipe follows). *After you measure out the dry oatmeal, put it in a blender, a bullet or food processor and process until it turns into flour. 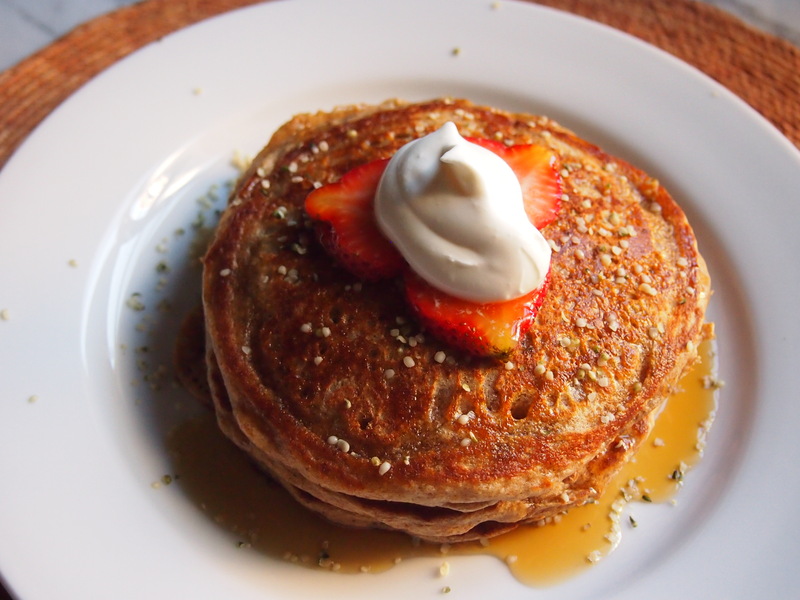 **If you don’t have buttermilk, don’t sweat it. You can substitute it by mixing 1 1/2 cups of regular milk with 1 1/2 teaspoons of vinegar. 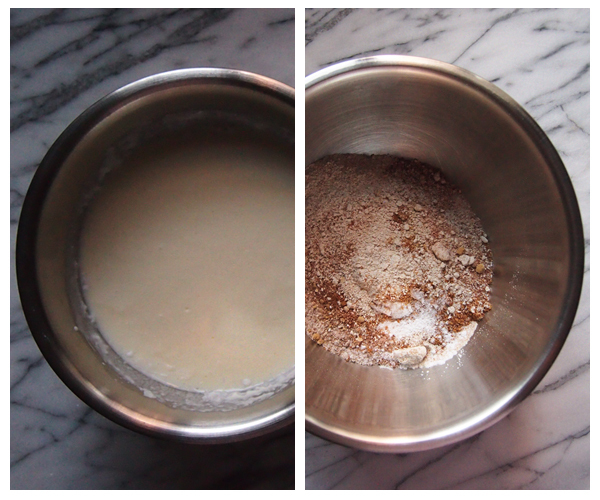 Mix thoroughly and you’ll start to see it curdle a bit like buttermilk would (it’s ok, that’s suppose to happen). Make sure your cream is cold straight from the fridge. You may add sugar to sweeten the cream. I left it out since I love maple syrup on my pancakes and that satisfies my sweet tooth just fine. Combine all ingredients and whip with either a whisk or hand blender until it is semi stiff. The time I felt guilty about eating a banana. Stopped dead in my tracks. Enter your email address to follow The Savory & The Beautiful and receive notifications of new posts by email.